During the research, we studied and described several different organizations, the enterprise «Georgian Steel Company», the hostel «Blue Bird» and the distribution company «Engadi». Analysis of «leakage» of personnel showed that in «Georgian Steel Company» this figure was 10%, in the «Blue Bird» hostel — 8%, in the distribution company «Engadi» — 20%. In order to estimate the cost of human capital, we used the following indicators: the annual wage fund; costs for so-called «Tying» the staff to the place of work — bonuses, bonuses and other costs not related to the production of products; costs for training and retraining of personnel; costs of production for medical insurance; reimbursement of staff costs for food, transportation and communication. The analysis showed that there are more costs in the areas of material production listed above. For illustration, we compiled table (1), where we estimated the costs of human capital in the firms under investigation. Summarizing, we can say that the overall level of wages is low as in other enterprises and organizations in Georgia, which negatively affects the overall development and quality of human capital in the country, in other words, the level of its reproduction. As can be seen from the table, each firm has costs for a variety of staff needs, but they are minimal and characterized by almost imperceptible growth. In general, we can consider them inadequate. In today’s conditions, in order to fully overcome the crisis and achieve sustainable economic growth, first of all, qualified, highly professional personnel are needed. This, in turn, is achieved by growing investments in human capital. The very notion of «labor» is directly connected with the concept of «human capital», but it is absolutely impossible to identify them. To develop human capital at the macro level, two groups of problems need to be resolved: on the one hand, it is necessary to find additional financial resources for the employed, which belong to certain groups of the population and the corresponding sectors of the economy; With another — it is necessary to carry out the corresponding reform in these sectors. We believe that these two problems need to be addressed in parallel, but each is independent. In addition, we note that the solution of only one — we consider an inefficient expenditure of human and financial resources. Thus, the effective use of human capital, which in our opinion means its preparation and further improvement, can give the Georgian economy a chance to achieve economic growth in the coming years. Consider the already changed relationships in the sphere of human capital in a market economy, which we grouped in the table (2). Let us analyze investment in education in accordance with the dynamics of investment in human capital. Economics of Information A feature of the information economy is that the resource of production is information of any kind; Representatives of mental labor predominate in the structure of the employed; Information resources are a product of mental labor. Human capital is characterized by a special, intellectual opportunity. New Economics In the new economy, a situation is formed in which human capital is considered an immaterial technological progress, but with the growth of its significance, the role of material and technical progress is changing. Economics of Free Time The condition for the development of a free economy is a high level of production of goods and services, which, in turn, is based on a resource such as human capital. Increasing the role of human capital makes it possible to increase the usefulness of free time. Intellectual Economics Since intellectual capital is connected with the human directly, their formation is associated with certain investments. In the intellectual economy, investment in human capital and technology is emphasized. The world practice confirms that the education system has the opportunity of normal functioning and development, as well as providing any citizen with compulsory secondary education in the event that no less than 5-7% of GDP is spent in this direction. It is clear that here take into account the economic conditions and traditions of the country. For example, consider the table (3), which compares Georgia with the leading countries in this area. It is clear from the above data that we can not consider the costs of education in Georgia to be satisfactory. This forces the system, to seek additional sources of financing and to improve the rational use of available resources. Consider the mechanism for financing education in Georgia in more detail (see table 4). Table (4) provides data on the dynamics of the financing of the education system in recent years in US dollars. As can be seen from the table (4), budgetary allocations do not exceed 1 percent, which is 10 times less than stipulated in the Law on Education (at least 10 percent). This is not enough to solve the problem. The biggest problem here is the inconsistency of the existing system with the requirements of the country’s sustainable economic development. The allocated funds do not cover the expenses for expanding the material and technical base of schools and the development of their technical equipment. It would be possible to improve the present situation by attracting budgetary funds, but, unfortunately, there is no corresponding economic base in Georgia for the creation of charity funds, patronage and development of sponsorship. Over the past decade, as we see, the education system received the largest funding from the budgetary funds in 2006 and 2007. Over the following years, this maximum rate was no longer achieved. 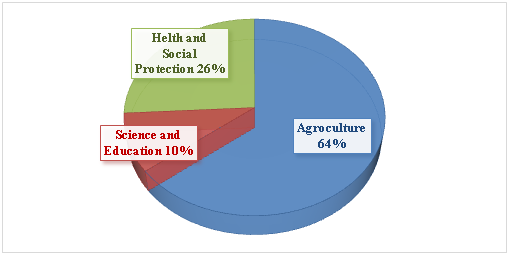 The new government, allocating its development priorities, allocated education to third place, while on the first and second are respectively health and social protection, agriculture (see figure 1). The structure of public spending on education is very interesting. For example, in 2014, the financing of economic sectors grew by an average of 9.5% compared to 2008, but in other areas they decreased by 10% over the same period. This gives us an excuse to conclude that the increase in the financing of industries was due to «other» expenses. To find new ways to rationally use and save existing funding. From qualitative and quantitative characteristics of investment funds directed to the sphere of innovations. Today in the labor market of Georgia, the crisis situation, which is caused by two contradictory factors: on the one hand, there is a high level of unemployment, on the other — a clear lack of qualified and educated professionals. Returning to the fair statement of the Minister of Education of Georgia, we add that by its implementation we see decentralization of decisions in all economic spheres, in particular, the spheres of labor and educational services and their interaction. We consider it necessary to single out one concept, «competence». Previously, graduates of higher education institutions required the identification of specific knowledge in a certain field. Today this is not enough. The modern labor injury requires a young specialist to have a good ability to communicate in foreign languages, good computer skills, free orientation in special computer programs, intelligence and practicality, good skills of adaptation with changing conditions. The skill to mobilize your subordinates for an effective work process. 178 (64.3%) of respondents considered that competition in the labor market is high because universities produce an excessive number of specialists whose qualifications are almost identical, therefore employers prefer workers with a certain length of service. This excludes the recruitment of graduates. Thus, there is a certain disproportion in the labor market between supply and demand. Georgian universities often train cadres in specialties that are not in demand in the market. However, it is also clear that the state education policy can not immediately proceed to forecast the required number of specialists in different sectors. We believe that the preparation of the required specialists should regulate the state order for the preparation of the required workers, which will be placed in a particular university on a competitive basis. We are confident that this would become an instrument of regulation for harmonization and balancing of issues between the labor and educational markets. As we can see, in the specified period the number of those wishing to obtain higher professional education decreased almost to zero: if in 2007 it was 27408 students, in 2015 their number decreased almost 10 times and amounted to 2,177. The state does not take any measures to popularize the professional higher education Education and raising its prestige. It is not enough to have higher schools, it is also necessary to create a special state employment program for its graduates after graduation. We consider that graduates of professional higher schools should be accepted for vacancies of workers and employees of low ranks, thus creating a demand for education of this type. This will be effective support from the state. And yet, the trend towards the development of the Georgian education system today is the orientation toward «compulsory higher education». In the educational sphere, there were 26 state and more than 200 private universities in 2015, of which the status of the university (three degrees of education (bachelor’s, master’s, doctoral) is only eight.In 2014, there were 124,200 students at the undergraduate and graduate levels, 3410. If before 1991 the most popular specialties were medicine, construction and engineering, today the picture has radically changed and the most popular specialties are social sciences, business and jurisprudence (table 5). As can be seen from the table, in 2010 the number of students specializing in business and law at the undergraduate level studied 66.1% of the total number of students, in 2015 this amount was almost unchanged and amounted to 63%. At the same time, the traditional specialty is the medical specialty. In 2010-2015, the maximum number of applicants was 43.1% in 2013 and the minimum 6.5% in 2014. On average, the figure was 17.1%. Unfortunately, it should be noted that in Georgia, agricultural and engineering specialties have ceased to be successful. During the period 2010-2015 the maximum number of those wishing to study in these specialties was recorded in 2013, when the state financed the teaching at these faculties by 100%. However, we note that this decision did not change the situation, and in 2014 and 2015 the number of applicants was 3.2 and 11.7 percent, respectively. The reason is obvious — the decline in agriculture and industry has reduced interest in these specialties and if there are no special state programs aimed at correcting state policy in this sphere, interest in these sectors of the economy will continue to fall, interest in the specialty is a product of the interconnection of labor and education markets. The XXI century is considered the century of biomedical technology. The innovative development of global healthcare should have its say in the implementation of technologies for the prevention, diagnosis and treatment of diseases. This, in turn, causes the emergence of new medical services in Georgia and their approach to international standards. It is known that one of the indicators of the quality of human capital is its level of health, shows how healthy the nation is. The Ministry of Health of Georgia carried out a reform, which is in full compliance with this postulate. This reform can really be considered an investment in the health and future of the nation. Since February 28, 2013, the Universal Health Insurance Program has been added to the two existing health insurance programs, which implies mass health insurance for the population. The universal insurance program insures all Georgian citizens living in the country who do not participate in other insurance programs. The programs of 2007 and 2012 (involving 2.1 million citizens), insured pensioners and persons deprived of social protection, children aged 0-5 years, students, children and persons with disabilities. These programs were carried out by private insurance companies. The program finances the prevention of diseases. Thus, today in Georgia, the quality of human capital, the trend of change that we described above, has changed in all respects. With the introduction of market regulators, the transformation of the human resource occurs slowly, imperceptibly, but thoroughly. Background. The purpose of the scientific article was to study the current state of the human capital of Georgia, to analyze the intellectual potential of the nation and prospects for the development of human capital in the future. Methods. The research uses various methods and techniques of analysis: graphic, statistical, comparative, correlation, etc. Results: 1) A private assessment of the state of human capital is formulated; 2) The relationship between labor markets and education is defined; 3) The quality and characteristics of the modern human capital of the country are determined. Conclusions. In Georgia, the quality of human capital, the trend of change described in the article, has changed in all indicators. With the introduction of market regulators, the transformation of the human resource occurs slowly, imperceptibly, but thoroughly.